Our wastewater treatment products combines patented technologies with engineering expertise to develop complete and customized wastewater treatment solutions designed to improve wastewater quality and minimize operating and maintenance expenses. We specialize in retrofits, allowing you to utilize your current equipment and infrastructure, while still meeting tightening requirements. Trusted worldwide in a range of municipal and industrial wastewater treatment facilities, our wastewater aeration products are tailored for a range of applications and designed to perform in the most trying environments. 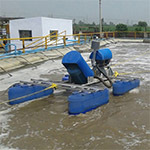 What makes our wastewater equipment unique is that it is modular and we offer a variety of mounting solutions, allowing for customized solutions that fit your specific needs. Learn more about our Mounting Solutions. We are committed to providing you with the solutions you need for your wastewater challenges. 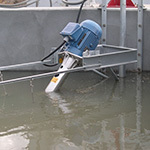 Learn more about our complete line of aeration and mixing solutions. 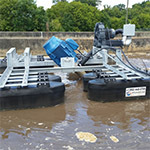 The Aire-O2® line of mechanical surface aerators have proven to be durable and reliable to meet all of your wastewater treatment needs, with universal mounting solutions. Efficient design and high quality materials make them a reliable and long-lasting solution in harsh environments. 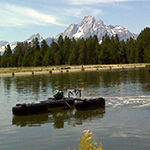 Learn more about our complete line of aeration solutions. Learn More. Aeration Industries' Aire-O2® surface mixers offer a powerful, slow-speed, variable mounting angle mixer, with low energy consumption. Ideal for aeration tanks, oxidation ovals, digesters, lagoons, anoxic basins, and chemical mix tanks. An above-surface motor ensures simple, nearly maintenance free operation. Learn More. The Aire-O2 Bio–ffilm® fixed film media system offers a cost-effective wastewater facility upgrade that increases plant performance, capacity, and facilitates year-round nitrification; even during cold weather. Learn More. Whether municipal or industrial wastewater treatment systems, with over 40 years of water treatment experience, Aeration Industries understands your challenges and recognizes the need to meet ever increasing environmental, regulatory, and budgetary expectations. 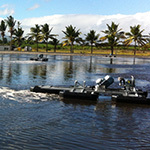 Learn more about our wastewater treatment systems. Learn more. If your outdated aeration system goes down, is unpredictable, or is ready for an upgrade; our Aire-O2 Triton® Process Aerator/Mixer can be shipped anywhere in the continental US in as little as 24 hours! Slip it in, turn it on, and your problem is solved; often in less time than repairing your old system and at a fraction of the cost for replacement. Learn more. Whether your facility needs a retrofit, supplemental aeration, an upgrade, or you're looking to expand capacity; Aeration Industries offers a variety of solutions that work to reduce costs, improve efficiency, comply with new effluent regulations, and save energy. 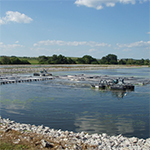 We can customize a solution for your wastewater treatment issues. Learn more.